Above: Deana McGuffin pictured with one of her handmade boots. NO BRAG, just fact: Deana McGuffin’s workshop is stocked with museum-quality boots. A pair by her father and mentor, L.W. McGuffin, sits alongside her own metallic-green-with-gold-swallows creations—the Albuquerque Museum displayed both in the 2015 Killer Heels exhibit. The New Mexico Museum of Art’s 2010 Sole Mates exhibition showcased her Day of the Dead boots, with jolly skeletons dancing across black leather. “I like flashy boots,” she says of her immaculate inlay and overlay. But does she actually wear them? “Of course I do! They’re my boots,” she says. And usually, she dons them with no-frills denim shorts. 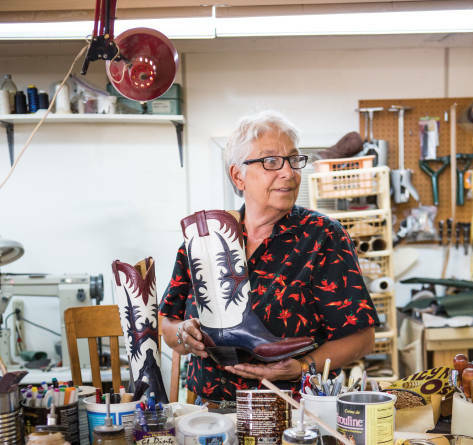 It’s her signature look, especially when she attends the Boot and Saddle Makers Trade Show, a who’s who of custom bootmakers held in Wichita Falls, Texas, where she’s both won awards and served as a judge. Rummaging among the sewing machines, awls, piles of leather, and manila folders etched with customers’ foot tracings, McGuffin holds up a pair by her student Wes Shugart. Freshly sober, Shugart spent two weeks with her finding, as he put it, something to do with his newfound idle time. He returned to Nashville with an eye toward turning professional. Music City Leather now outfits country stars with his own award-winning footwear. Yet this legacy is becoming more important. Brushing up against 70, McGuffin can envision a time when the physicality of bootmaking is beyond her. The art can be as tough as the cowhands that boots were originally designed for—bending and shaping the shank nail that becomes the arch support, forcing stitches through layers of unrelenting leather welting that connects the upper to the insole, and skiving leather layers so the boot’s inner lining meets the outer shaft at an effortlessly feathered edge. The possibility of decline—a slide she watched her father endure—gives her pause. “It was heartbreaking. I could look at his work and see where he was beginning to slip. But it is what it is,” she shrugs. “I can’t do anything about it. I just hope when it happens I can look at it and back out gracefully.” Although her grandfather had been making boots in the state since 1915, she didn’t come to the family craft early. At 32, Deana (pronounced “Deena”) asked her father to teach her. L.W., a quintessential craftsman, wasn’t keen on instructing his daughter, because he didn’t think she could handle the labor. “You let me worry about that,” she told him. “You just teach me. Whether it was to carry on the dynasty or to help his recently divorced daughter and 10-year-old granddaughter, a year later, in 1982, the elder McGuffin relented. A snapshot hanging in McGuffin’s workshop now captures her early apprenticeship. A black Rocky III T-shirt with cutoff sleeves exposes her muscular arms, already toned by the factory work and house painting she’d done previously. A red bandanna across her brow contains a dark mop of hair—just as Rocky’s sweatband did. As one of the first females in the male-dominated field, she had to go ten rounds with her father’s expectations as well as her customers’. It took a decade—about the time the two were invited to do a demonstration at the Smithsonian Folklife Festival—before she earned her father’s praise. “It was the first time he told me I made a good pair of boots without saying ‘but’ after,” she says. Even if, in the future, she steps back from boot-making, it will never be far way: Classic vamp stitch-work is inked into the tops of her feet, as though her many days of boot wearing left permanent impressions, as she has left upon the craft itself.